When users search for any place in the world, they see a map, with four layers of information. There’s info on bio-climates, described with terms like “warm wet” or “hot dry”; landforms, with terms such as “flat plains” or “mountains”; rock type, with terms like “carbonate sedimentary rock” or “metamorphics”; and also land cover, the vegetation that results from these conditions, described with terms like “forest, farmland, or grassland.” For all data types, users can also further zoom in, all the way to the street level. Indeed, the team is hoping for lots more new data, given there are “known and expected deficiencies in the current input layers. 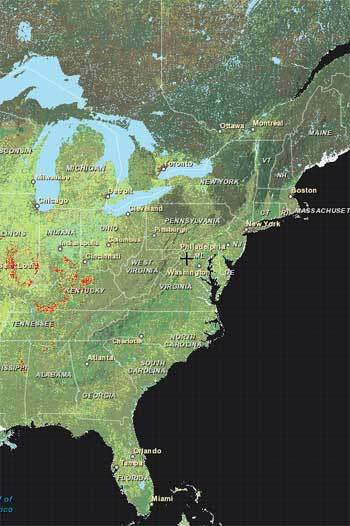 For example the release of the new SRTM 30 meter elevation terrain data provides an opportunity create a higher resolution landforms map.” They are looking into adding data about social and cultural factors. 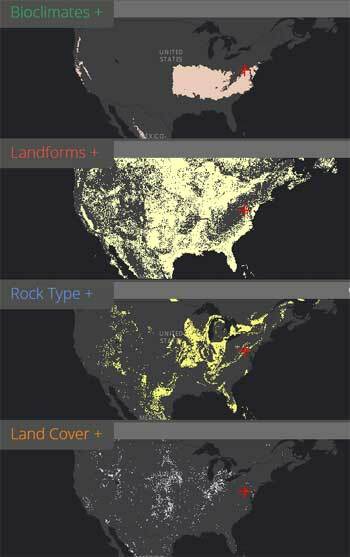 USGS and ESRI also hope that other scientists will use GIS to add their own layers and do their own analysis over time. Also, check out a map the team created of 10 of the world’s ecological hot spots, places with high levels of ecological diversity. A great companion to the online PRISM and BONAP mapping. GIS and computer modelling, using all the data that’s now available, is finally coming together to map out our natural world affecting the work of landscape architects. Or at least should. It also takes away human bias, including old, dated works that are based on perception, often by someone who hasn’t visited even the broader region they classify and map..
Now, it’s a matter of removing short-term, incomplete climate records from their mix as well as factoring in more aspects of climate such as average and extremes of cold, seasonality of precipitation, and so on. Adding links and navigability would help, including what systems of classification and reasoning for each map type. Not to mention add more interactivity, where one can shift climate and other parameters, and turn on and off various layers and base information, to customize and output a map. Temperate/subtropical ‘key’ ecosystems of New Zealand?